In the quest for increased control over engine temperature and lower parasitic power loss many people turn to electric cooling fans to solve their issues. One aspect of converting to electric cooling fans that is often overlooked is how to control the fans, until now! Most modern vehicles control their cooling fans by using their on-board computers to monitor parameters such as vehicle speed and a/c usage, not just coolant temperature. If you’re looking for a solution to control your electric cooling fans that will monitor more than just coolant temperature, then the F5 Fan Controller is your answer.This solid-state pulse-width modulated controller has the ability to control your cooling fan speed from 50% all the way to 100% fan speed based on user programmable settings. Bellow you will find a list of features that sets our controller apart from other aftermarket cooling fan controlling solutions. Control over the engine temperature that your cooling fans turn on, between 160 and 235 degrees Fahrenheit.  * Your fan speed will fluctuate from 50% to 100% as your engine temperature fluctuates between the two user programmable temperature settings. Ability to run fans at 100% fan speed when your A/C compressor is running, regardless of engine temperature.  * Ability to turn fans off at a programmable vehicle speed, if vehicle speed sensor is used.  * Ability to override the controllers logic and turn the fans completely on or off at any time.  * Available in dual fan (two 35amp fans) or single fan (one 70 amp fan) configuration.  * No external relays are required. 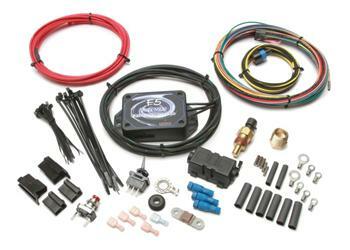  * Kit includes everything needed to install the F5 Fan controller on your vehicle. Includes controller, labeled vehicle integration harness, buttons, switches, 70 amp fuse, and compatible Delphi coolant temperature sensor.